Budd Park sits on the land formerly owned by Judge Azariah Budd, a lawyer, judge, and transportation magnate originally from Pennsylvania. Budd retired to Kansas City in 1879 and raised cattle on his 40-acre plot. In 1889, Budd willed the City 20-acres on the condition the City paid his widow, Sarah Ann, $3,000 annually until her death. Budd Park was officially established in 1891. Sarah Ann later donated four additional acres and the City acquired two more before settling at its current 26-acre size. In Aug. 1916, a portion of the park was designated as a women’s only space. Newspaper reports from the time state that a temporary shelter house and “other improvements” were built in the designated women’s section. It’s unclear how long the designated women-only area lasted, or if the shelter house or other improvements still stand today. A native stone frame shelter designed by Edward Buehler Delk and built in 1922 (some reports indicate it was built in 1927) sits where a wooden frame shelter designed by John and Adriance Van Brunt was erected in 1895 by L. G. Jeffers (shown above). The tennis courts, while updated, are located where the original courts stood in 1907. The park has a thriving playground that has the rare advantage of plenty of shade and green grass. Also there is the most popular wading pool in the city because it is large and deep, in fact it should be called a semi-swimming pool. There were also four tennis courts, roque courts and shady spots for picnicking. The Budd Park pool still stands today. In 2000, a $600,000 public improvement project funded updates to the pool and improvements to the walking path. 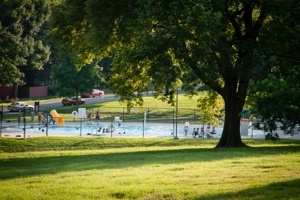 In 2017, the Indian Mound Neighborhood Association was awarded $150,000 from the Public Improvements Advisory Committee for a new filtration system, shade structures and water features for the pool. 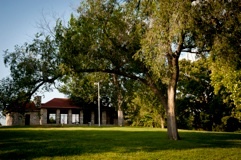 Budd Park is located at the center of the Indian Mound neighborhood, which makes it a perfect place for community events, family gatherings, or a relaxing stroll. 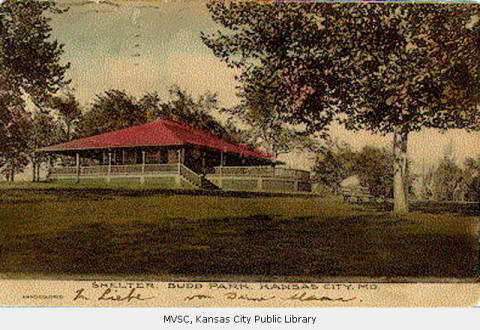 Between 1893 and 1918, the Old Men’s Association (a social club for men who were age 60 and over and lived in the Kansas City area) held their summer picnics at Budd Park. 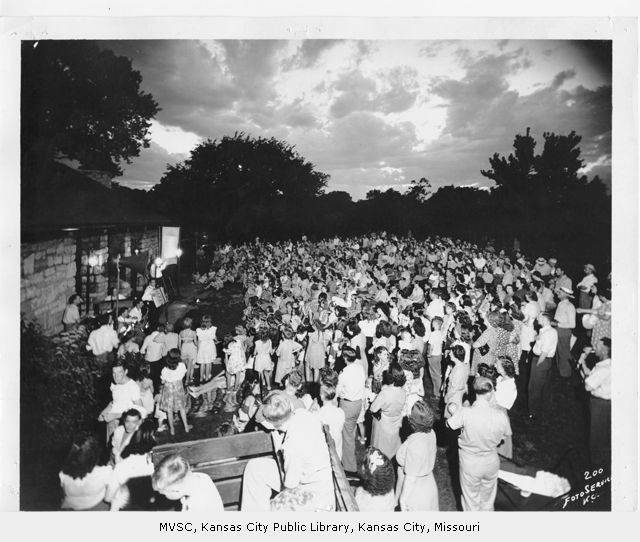 Photos from the early ’40s show residents engaged in a community singing event. Others feature the North Area Playground Fair (shown at bottom), complete with a boxing ring in front of the main shelter house. 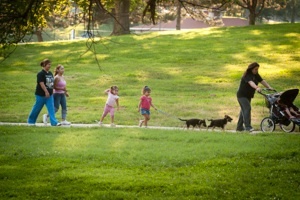 Today, Budd Park is a place where children enjoy the playgrounds, families walk their dogs, and community organizations like Soccer for Success utilize the soccer fields. Weekends see celebrations in the south shelter house, or official events like Budd Park Community Days (fourth Saturdays of June, July, and August) or Club KC / Mayor’s Nights Kicks. Photo sources: 1, 3, 5. David Remley. 2. 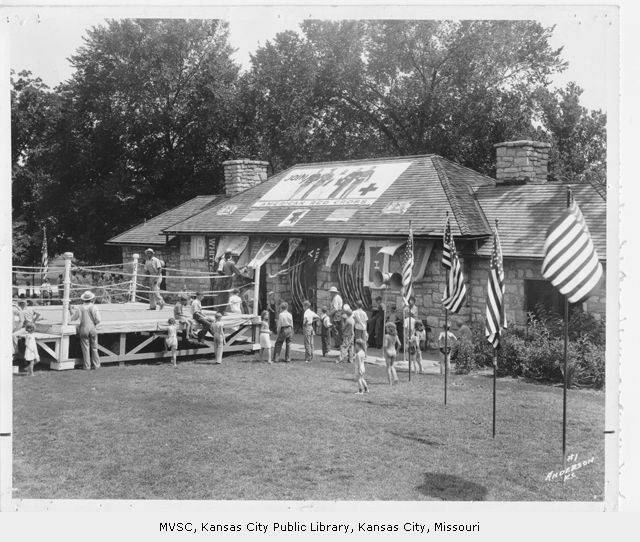 Missouri Valley Special Collections, Kansas City Public Library, Kansas City, Missouri. 4. Missouri Valley Special Collections, Kansas City Public Library, Kansas City, Missouri. 6. Missouri Valley Special Collections, Kansas City Public Library, Kansas City, Missouri. Content sources: Missouri Valley Special Collections, Kansas City Public Library, Kansas City, Missouri; KC Parks; Lost Womyn’s Space.